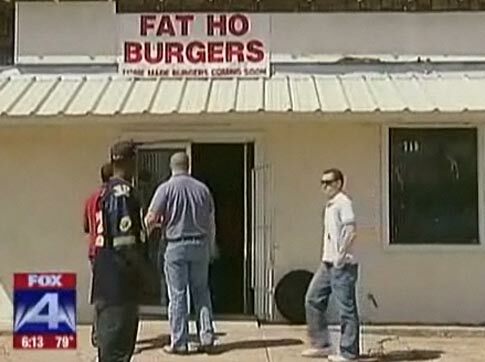 If you’re strolling around in Waco and feel a rumble in your belly, look no further to satisfy your hunger than Fat Ho Burgers. Yes, that is the name of a new burger joint that serves the Supa Dupa Fly Ho with Cheese and the Sloppy Ho Brisket. Coincidentally, I love sloppy ho’s and brisket. For the kids and sexual predators alike, there’s the Little Ho. According to the video, the food at Fat Ho is delicious and business is booming. Maybe they can use some of the revenue to buy better signage. Personally, I enjoy the fact that it appears like restaurants in Texas are operated out of people’s homes and the menu is printed off Microsoft Word. Still, it’s classier than the KFC on 14th St. and 2nd Ave. I’m just surprised that Star Jones isn’t somehow involved in this venture.